In 2016, for its 60th anniversary Play-Doh launched their new communication platform called “A can of Imagination”. Last year, DDB Paris created "In the world of Play-Doh" campaign: 3 fully hand-made press and poster ads exploring what the world of Play-Doh looks like. Made entirely with modelling clay, the campaign was 100% in Play-Doh's DNA. The campaign, that won 3 Cannes Lions in June 2017, has now a follow-up online. 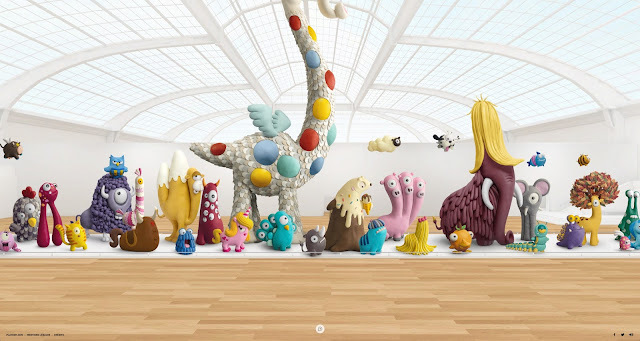 The concept of the second ad: "in the world of Play-Doh, every day you see new emerging species" is now an online gallery. Developed in partnership with digital production studio Merci Michel, the Gallery of Emerging Species is a website designed like a fun museum of natural history. On it, dozens of imaginary species are showcased, all hand made in modelling clay, then animated and described, one by one, with the tonality of "National Geographic" documentaries. The Gallery of Emerging Species is aimed to parents as to their children. Kids can enjoy the shapes, colours and sometimes names and stories of these rather curious animals, whereas adults can enjoy the many jokes and references distilled by the - not so - serious voice-over. The Emerging Species campaign is a way to underline the amazing power of creation that modelling clay offers. But most importantly, to promote the idea that children can do a lot with a bit of imagination. Even changing the fate of our planet, where species do not emerge, but sadly become extinct. Because the Future is - literally - in their hands. Each new species is shared on Facebook, where people are invited to share their own newly discovered species. The most creative ones will be exposed in the Visitors’ Gallery, next to the main hall, on the website. The Gallery of Emerging Species also includes a series of 5 animated videos made by French studio Eddy, all ran online along with radio messages and posters.